Mark Rossetti, a reputed Mafia leader who was indicted last year on state charges of running a sprawling criminal enterprise of drug trafficking, gambling, and loan sharking, had been working all along as an informant for the FBI, according to documents filed yesterday in Suffolk Superior Court. 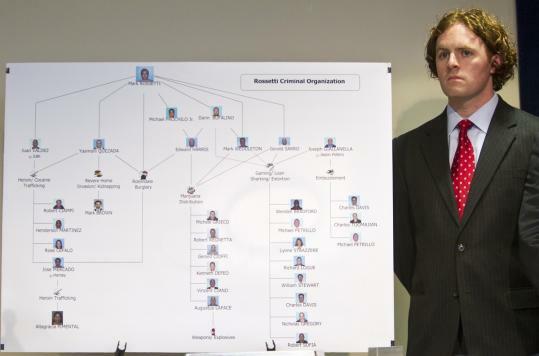 The documents, filed by two lower-level players in Rossetti’s alleged crime ring as part of a legal strategy in their own case, do not identify Rossetti by name. But he can be clearly identified through descriptions of his conversations with his FBI handler, and through a State Police organizational chart of his alleged crime ring, the Rossetti Criminal Organization. Rossetti is a reputed capo in the New England Mafia. State Police recorded more than 40 conversations between Rossetti and his FBI handler in the spring of 2010, through a wiretap on Rossetti’s FBI-issued phone, according to the court documents. In the conversations, they discussed other Mafia figures and the possible role of Rossetti’s cousin in the 1990 art heist at the Isabella Stewart Gardner Museum, as well as Rossetti’s debt collections. According to the documents, it was during these conversations that State Police discovered Rossetti was an FBI informant. Rossetti later grew concerned that he was being investigated by the State Police. He revealed to his handler on May 14, 2010, that his phone had been tapped, according to court records. The disclosure that Rossetti, a high-ranking Mafioso, was working with the FBI at the same time he was being targeted by the State Police raises questions about how closely the FBI was monitoring him and whether the bureau was aware of the extent of his alleged activities. The complete nature of Rossetti’s relationship with the FBI was not immediately clear yesterday. When working with informants, the bureau is required to follow clear guidelines that restrict what the informant may do. Gregory Comcowich, a spokesman for the FBI’s Boston office, said last night that he was aware of the court filings but would not comment on details of Rossetti’s relationship with the bureau. According to court documents, Rossetti expected to be spared from prosecution for the crimes he committed with the FBI’s knowledge, but he worried for his safety if it appeared he was getting special treatment from authorities. “In a compelling exchange, [Rossetti] states . . . he knows he will be protected for the crimes he has been committing with the knowledge of his handler but that he is concerned about the appearance of his not being sent to prison if everyone else in the upcoming case is incarcerated and whether he will be forced to testify before a grand jury,’’ one court filing states. The conversations continue, with Rossetti calling his handler asking for permission to meet with loan collectors, to back off other collections, and to aid people who needed him to intercede with other criminals on their behalf. Stricter FBI guidelines were adopted a decade ago after the bureau’s scandalous relationship with longtime informants and gangsters James “Whitey’’ Bulger and Stephen “The Rifleman’’ Flemmi was exposed, requiring more oversight of the agent-informant relationship. Rossetti’s lawyer on the state charges, Randi Potash, argued that there is no public proof that her client worked as an informant. The FBI’s mishandling of longtime informants Bulger and Flemmi was exposed in federal court hearings in Boston in 1998, triggering a national scandal resulting in congressional hearings, the revision of the informant guidelines, and an avalanche of lawsuits brought by victims’ families. Flemmi is serving a life sentence for 10 murders and Bulger is awaiting trial on charges that he killed 19 people, most while he was an FBI informant. Bulger was arrested June 22 in Santa Monica, Calif., after 16 years in hiding. State prosecutors described Rossetti as a violent gangster when they indicted him in October 2010 on charges he ran a criminal enterprise with the involvement of at least 30 other people. The investigation, conducted by troopers assigned to the State Police Special Services Section, involved the execution of 30 search warrants and the seizure of $1.3 million in cash from extortion cases, $120,000 in alleged drug money, more than a kilo of heroin, a heroin press, 200 pounds of marijuana, a pipe bomb, two bulletproof vests, a rifle, a loaded handgun, and five motor vehicles. One of the men charged was Darin Bufalino of Winthrop, Rossetti’s alleged “soldier.’’ He pleaded not guilty to attempted extortion, conspiracy to commit attempted extortion, and being a habitual offender. The Suffolk Superior Court records were filed by Boston attorney Robert A. George on behalf of his clients Joseph Giallanella and Michael Petrillo, two alleged players in Rossetti’s crime ring. They are seeking to have charges dismissed based on Rossetti’s relationship with the FBI. According to the documents, they argued that any evidence obtained in relation to Rossetti should be dismissed because his relationship to investigators was not disclosed to judges who approved wiretaps and search warrants.